As a primary mode of communication, you probably have some of your most important conversations with friends, family and even co-workers via text message. But just like any other type of data on your iPhone, text messages are prone to loss. You can accidentally delete an important message, a system failure can wipe away all the messages on your device or hardware damage to your device can cause you to lose all your important text messages. It is therefore important to have a backup for text messages. Yet, most iPhone users don’t like to back up their text messages via iTunes or iCloud. Most people say it can be very difficult to access the messages at a later date owing to the fact that iTunes and iCloud backup files are inaccessible unless you restore the device. 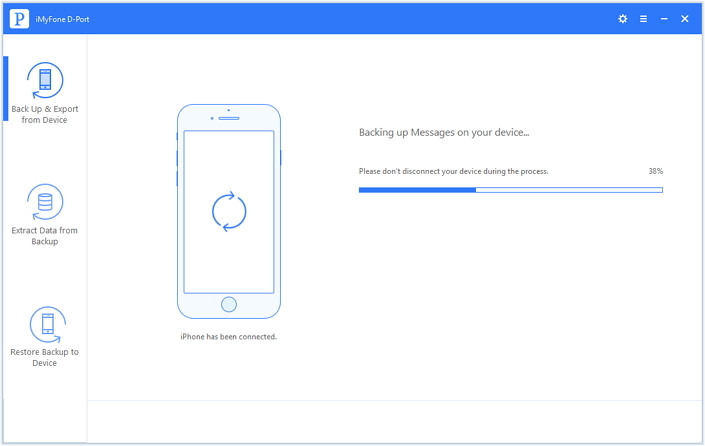 And since no one wants to restore the device just to get back a few text messages, we have an alternative way to back up your text messages so they will be easily accessible when you need them. One of the most effective ways to backup text messages is to export them to your computer. a third-party tool, iMyFone D-Port makes this process easy and quick. This program is designed to help you export all messages to your computer in a clean and efficient manner, no matter how many messages you have. Some of its features include the following. It is very easy to use and 100% safe. None of the data on your device will be at risk of loss or damage. It can be used to extract and export messages from the iPhone or an iTunes or iCloud backup. It is available for both Windows and Mac users and is compatible with all iOS devices. 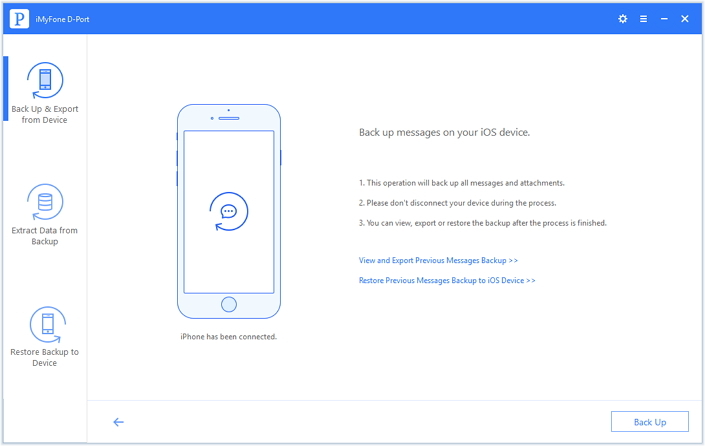 To back up all text messages from your iPhone to your computer, you'll need the following. Step 1: Launch D-Port and then select "Back Up & Export from Device." Click "Back Up Messages" and from the 5 options iMyFone D-Port offers. Step 3: Then the program will start to back up all the messages on your iPhone. Wait for the process to be completed and don't disconnect your iPhone during the process. Then it is done! 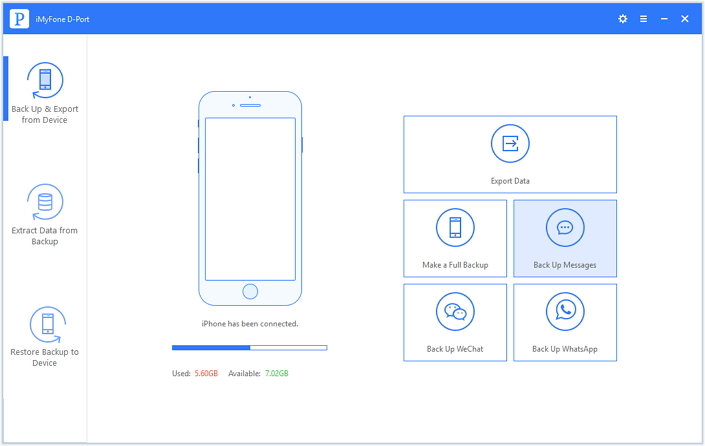 You have a separate messages backup on your computer and you can do what you want from it, such as extract messages from it ot restore the messages backup to another iPhone with the pro version of iMyFone D-Port. Download the Free Trial version of iMyFone D-Port and see what it can do for you.